This October has been a bit different for me. It’s the first year where someone very close to me has been affected by breast cancer. As this is Breast Cancer Awareness month, I wanted to share her story with you. I first met my good friend Isaedmarie (Isa) Febo in the Spring of 2014. She came to me determ ined to run a 5K, get fit and shed some weight. She was totally committed. We came up with a plan and she got to work. By the end of 2014, she’d completed multiple 5Ks, a few 10Ks, a half-marathon, some obstacle course races and even a 200-mile team relay. She’d lost body fat, gained leaned muscle and felt amazing as she shifted her focus to setting the bar even higher for 2015. Amazing. But that’s when her life changed dramatically. What began as a simple follow-up on a benign mass in her left breast, ended in a Stage III breast cancer diagnosis in her right breast in April of 2015, just a few weeks before her 29th birthday. The tests revealed that she had multiple tumors and the cancer had already spread to her lymph nodes. With the future now uncertain, one thing was crystal clear: hers was a very aggressive case and there was no time to lose. So she bravely started treatment within days of the diagnosis. All of her race plans were placed on hold and instead she entered an even tougher and more important competition: The fight against breast cancer. Right out of the gate, she approached it like any other challenge. She built a solid support team of cheerleaders including her husband, family and an army of friends and health care providers. 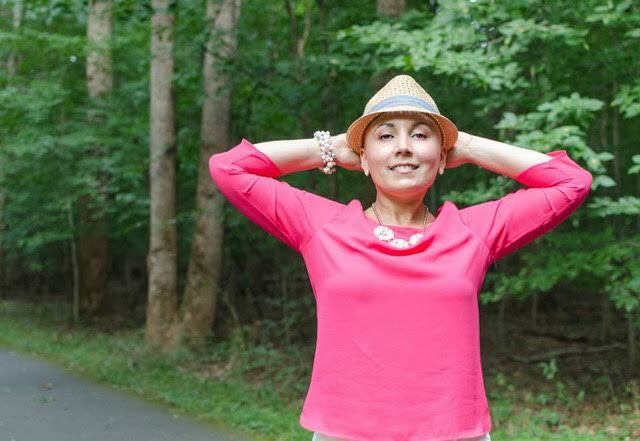 She approached each chemo treatment like another mile-marker passed, gradually moving her one step closer to the finish line. She ate for performance, nourishing her body with the nutrients necessary to stay strong and fuel the fight. She stayed focused. 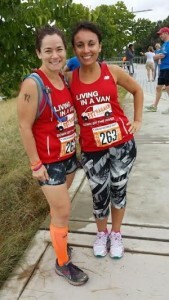 As every “mile” got harder, she pushed through with courage and confidence. Her healthy and active pre-diagnosis lifestyle laid the foundation that enabled her to masterfully balance her life, work, treatment, and fitness. She was able to maintain a relatively normal work schedule — even traveling to an out-of-state conference to present some of her professional research findings — while still allowing herself time to deal with the side-effects of each of her chemo. She was able to continue a modified workout schedule that included interval training, hiking, running, yoga, and swimming. This helped strengthen her body and relieve stress. She hasn’t suffered any major complications, experienced any neuropathy or any other lasting side effects. And she has maintained full function in all major organs. 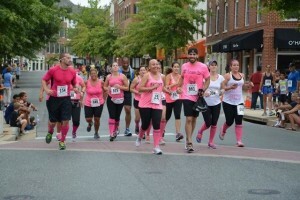 4 weeks after her sixth round of an aggressive chemo treatment — and just days before her double mastectomy — Isa ran 5K with her running club by her side. She impressed her surgeon by raising her arms more than halfway up only a day after her double mastectomy then by extending her arms over her head and even reaching her own back just six days post-op. Within 10 days of surgery, she was medically cleared for low impact cardio. I’m not saying it was easy but her hard work has paid off. Her healthy, strong, and fit body has been more than capable of managing side effects. She’s not done yet. Her post-mastectomy pathology report revealed that her cancer cells are HER2-positive. As a result, there’s been a change and extension in her treatment schedule but she’s as strong, positive and healthy as ever. Besides a fit and healthy lifestyle she has another secret weapon. Smiling. Yep, smiling. Some days she’s had to dig really deep to muster the strength for this signature move, but it’s one that Isa still performs daily and highly recommends. “Try it, even if you don’t have cancer,” she tells people. In honor of Breast Cancer Awareness Month we’ve got a special offer to try AcaciaTV at no cost. Click here for more details.